Today, hematite beads are attaining a high level of popularity, especially in the jewellery creative world. Not only are they very pretty to look at when polised, not only do they hold the traditional symbolic meanings .. but now they come to us in a plentitude of shapes & sizes & Colours! And with the introduction of Magnetic hematite beads, they now can do what no other beads can do & jewellery makers all over the world are coming up with amazingly creative & popular ways to accessorised ourselves. Hematite (Fe2O3) is a naturally occuring iron oxide that is reddish to brown to black in colour. It is composed of splendid rhombohedral crystals that are very heavy and cold to the touch. silvery, shiny opaque stone. This is the stone that looks like it could be metal. 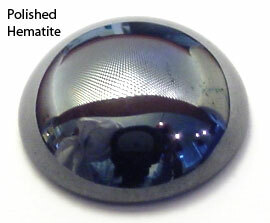 Genuine hematite is heavier than most stones and seems cold when you first touch it. This mineral can also be cut and polished to yield a relatively inexpensive semi-precious gemstone. It can also be polished to such a high sheen that long ago they were used as mirrors. Hematite is made into bracelets, necklace, rings and ornamental figures. This stone is often used as worry beads. It was also believed that it had some protective powers so that in the old days, warriors used to rub their bodies with it in the belief that it would protect them. Hematite is believed to deepen the connection between spirit and body, and so helps prevent someone from being easily affected or influenced by other people's negative emotions. The reflective quality of the stone symbolizes its ability to help deflect the emotions of others.